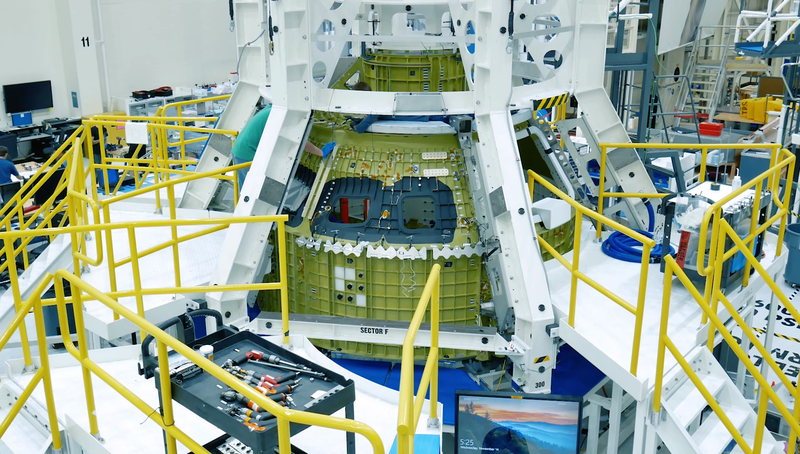 The 404-day clock to connect, checkout, and test the first integrated Orion spacecraft for its flight to the Moon started in early November with the arrival of the European Service Module (ESM) at the Kennedy Space Center (KSC) in Florida. All of the major Orion hardware for Exploration Mission-1 is in the Operations and Checkout (O&C) Building at KSC for the first time, where prime contractor Lockheed Martin will finish assembly. There is essentially no padding in the year-long schedule, so technicians wasted no time unpacking the ESM and immediately began preparations to mate the U.S.-built Crew Module Adapter (CMA) to the top of the module. The schedule calls for completion of assembly and checkout of the first integrated Orion, a series of tests of the new vehicle in Ohio, and final work back at KSC to hand it over to Exploration Ground Systems (EGS) for launch processing. ESM Flight Model-1 (FM-1) arrived at KSC onboard an Antonov An-124 aircraft inside a transportation container, with the jumbo jet touching down at the Shuttle Landing Facility on November 6. Completion of FM-1, the first ESM flight article, is a major milestone in Orion Program development and in the schedule to prepare for its launch on the Exploration Mission-1 (EM-1) test flight, currently forecast for 2020. Assembly, integration, and testing of FM-1 had been a primary or secondary critical path item in the EM-1 schedule. 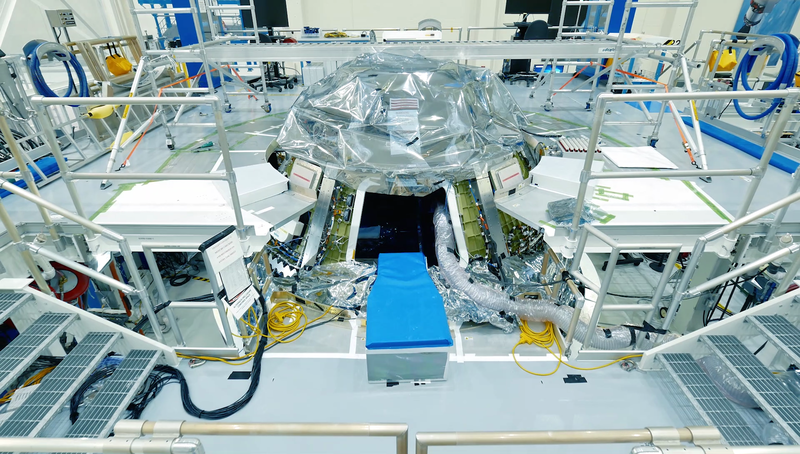 Images of ESM FM-1 at the Airbus Assembly, Integration, and Testing facility in Bremen, Germany, during pre-shipment activities in early November, 2018. Credit: NASA/Rad Sinyak. 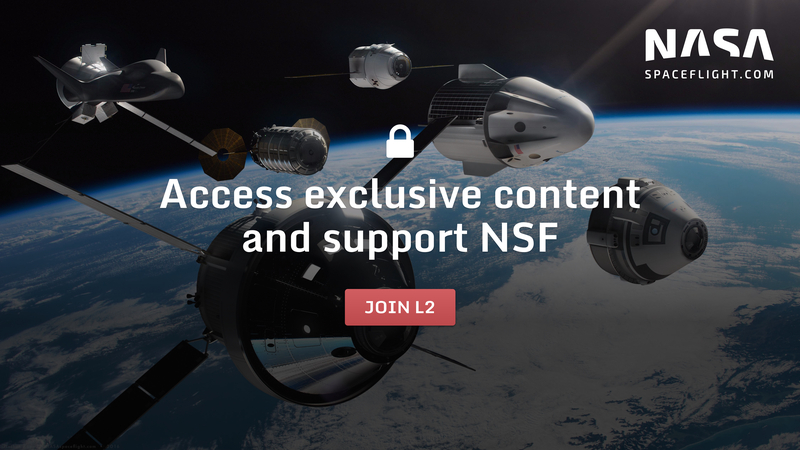 “With the delivery of this ESA (European Space Agency) Service Module we now finally have the element that allows us to take people farther into space than we’ve ever gone before, so it is a really big event for all of us in the Orion Program,” Mark Kirasich, NASA’s Orion Program Manager, added. The ESM provides the equipment for propulsion and attitude control, long-duration power, thermal control, and consumables for the spacecraft and eventually multi-person crews on future missions. It forms the core of the overall Orion spacecraft’s Service Module (SM), which includes the CMA and aerodynamic launch fairings that are jettisoned during ascent. The spacecraft that will fly the EM-1 test flight is the first with working versions of all the modules, minus the provisions for crew. 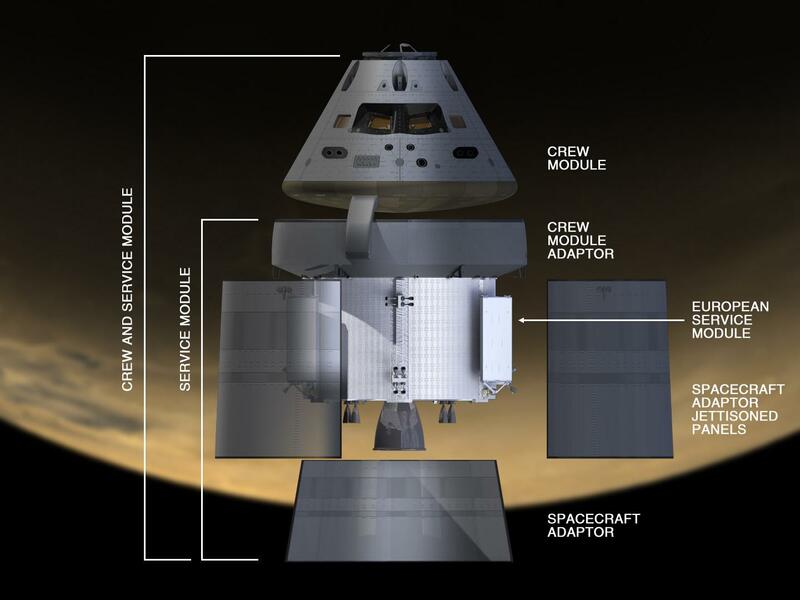 The first Orion test flight, Exploration Flight Test-1 (EFT-1) in late 2014, flew the first working Crew Module (CM) with mass simulators for the Service Module elements. The shipping container holding the European Service Module (ESM) is moved out of the cargo hold of the Antonov cargo aircraft at the Shuttle Landing Facility at NASA’s Kennedy Space Center in Florida on Nov. 6, 2018. Credit: NASA/Frank Michaux. On EFT-1, the spacecraft remained attached to the upper stage of the Delta 4 Heavy launch vehicle until shortly before re-entry, flying a four-hour mission to an intermediate altitude Earth orbit. Orion will fly independently on EM-1 for the first time; following delivery by its Space Launch System (SLS) launch vehicle on a trans-lunar trajectory, the spacecraft will fly into a Distant Retrograde Orbit (DRO) of the Moon and stay there for up to a few weeks before making a mirror image set of burns to return to Earth. There is a lot of work to do to finish putting the EM-1 Orion spacecraft together and make sure it is functioning correctly. 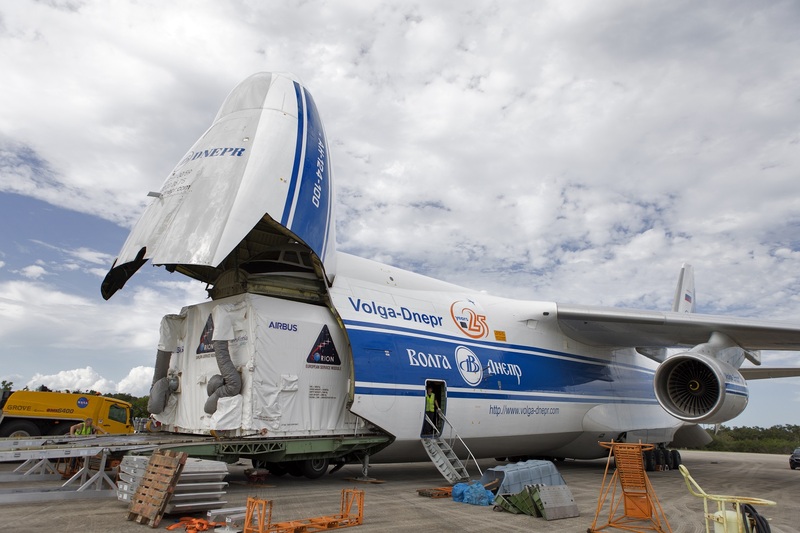 A 404-day schedule of assembly, checkout, and testing started when the ESM arrived in Florida, and the module was immediately taken off the An-124 transport and driven to the O&C building to start work. After removal from the shipping container, the ESM went through a post-shipment functional test to verify everything was still working and then preparations began to attach the CMA to the top of the ESM. The CMA sits between the Crew Module and the ESM and provides the interfaces for command and control instructions from the flight computers in the CM to the ESM and for all of the supplies and data provided by the ESM to the CM. The ESM and the CMA are the major elements of the overall Service Module (SM) and the first step in that assembly is structural attachment. The Orion Crew Module and Service Module elements. The Service Module is surrounded and supported by panels jettisoned during launch and a Spacecraft Adapter cone that connects Orion to the launch vehicle. Credit: NASA. Almost two-hundred bolts will mate the elements and the bolt holes are being lined up after the two elements were set up in a work stand. On the day of the ceremony celebrating the arrival of the ESM, the team was working on finishing alignment and getting ready to start bolting the CMA and the ESM together. 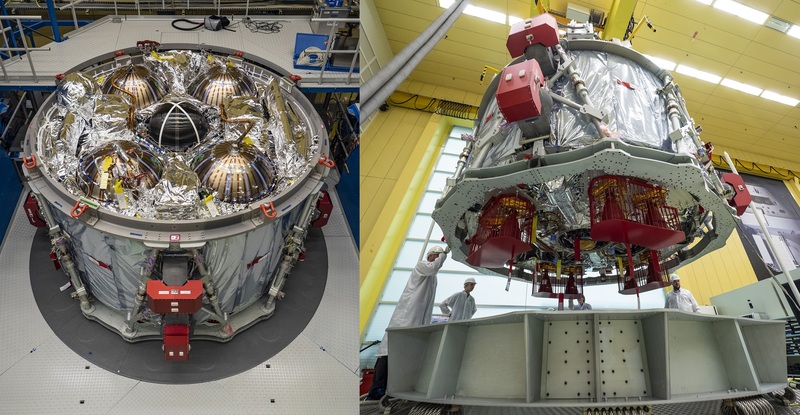 Assembly and checkout of the combined Service Module will run into 2019, making all the connections between the ESM and the CMA and making sure the Service Module systems are all functioning to specification. “Our first activity is here in the lift station, we are structurally mating the Crew Module Adapter with the European Service Module,” Amy Marasia, NASA EM-1 Orion Crew Module Assembly Lead, explained during the event. Image of the CMA-ESM mate from video taken in the O&C Building on November 14, 2018. 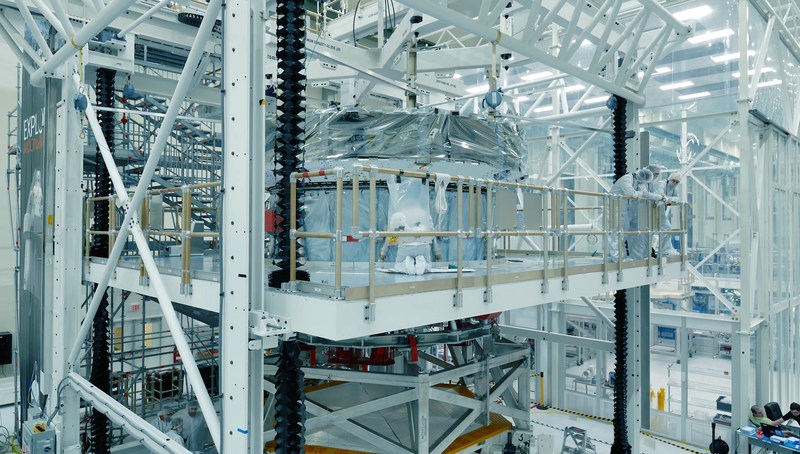 In the background right is the enclosed clean room where the mated elements will be moved in the next phase of Service Module integration and testing. Credit: NASA/Rad Sinyak. On the other side of the clean room from where the Service Module is being mated in the O&C Building at Kennedy, the EM-1 Crew Module is also getting ready for mating with the Service Module next Spring. The EM-1 Crew Module in the O&C Building on November 14, 2018. The opening for the side hatch is seen center image. The side hatch is the last major hardware piece remaining to be installed on the module. Credit: NASA/Rad Sinyak. 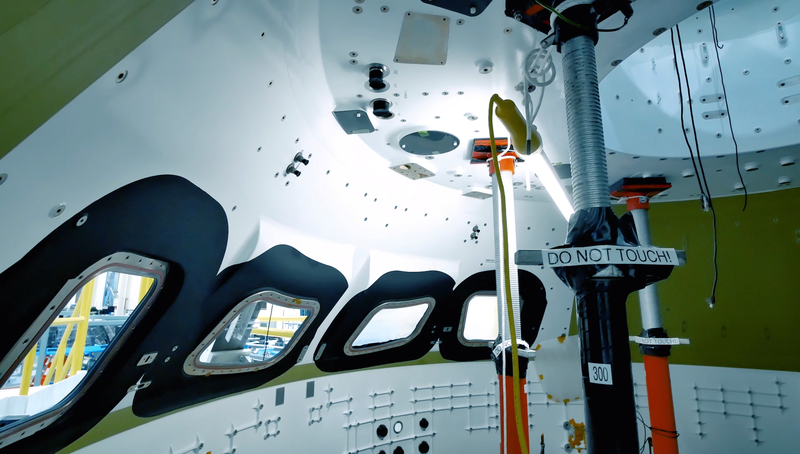 In contrast to all welded connections between the Service Module elements, the connections from the Crew Module to the Service Module have to be pyrotechnically separated at the end of the mission just prior to re-entry, so they aren’t as invasive. “It’s much simpler, we have the mechanical bolts, four of them, and then we have the umbilical that has some fluid [connections] and then some electrical harnesses go through the umbilical,” Kirasich noted. The spacecraft will then be prepared for shipping to NASA’s Plum Brook Station in Sandusky, Ohio. The integrated stack will be wrapped up and reoriented for transport on NASA’s Super Guppy aircraft. “We use something call a ‘verticator,’ which takes it from the vertical and puts it horizontal and puts it in a plane,” Kirasich noted. Another image of the EM-1 Crew Module in the O&C Building on November 14, 2018. The heatshield, which was installed in July, can be seen in the lower access level. Credit: NASA/Rad Sinyak. 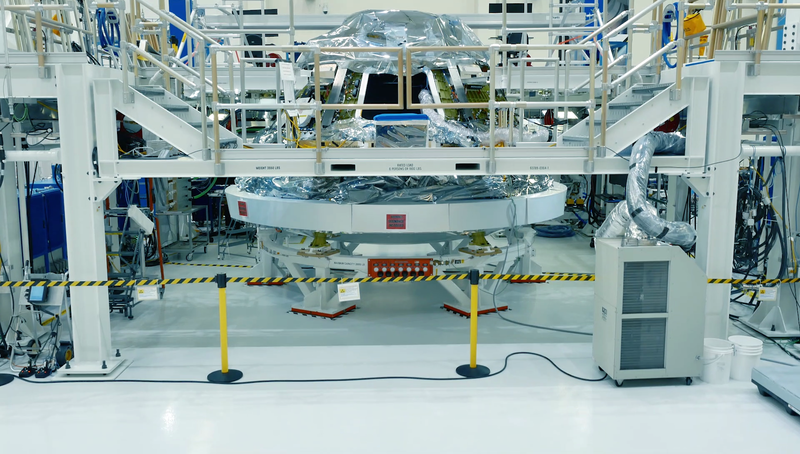 At Plum Brook, this first integrated Orion will go through a series of environmental tests. “The Space Environment Complex there has the world’s largest vacuum chamber, it is about a hundred feet in diameter and a hundred and twenty-two feet high, and that is one of the reasons Orion chose that facility because of its size and its capability,” Sue Motil, NASA ESM Integration Manager at Glenn Research Center, said. Although a part of the testing at Plum Brook, the solar array wings will be removed during transportation; once back at KSC final installation will be completed, along with installation of the launch fairings on the Service Module. Final closeouts of Orion will also be made to turn the spacecraft over to EGS Spacecraft and Offline Operations for EM-1 launch preparations. EGS will pick up Orion at the O&C Building and take it to first be loaded with propellant and other commodities for flight, and then to be attached to the Launch Abort System tower and structure to complete Orion’s launch configuration. The spacecraft will then be rolled into the Vehicle Assembly Building for stacking on top of SLS to complete the EM-1 vehicle. A little farther down the O&C building, the crew module for Exploration Mission-2 (EM-2) continues its structural outfitting. The pressure vessel that is the working and living compartment for the crew arrived in Florida at the end of August and is now inside the “birdcage” tool. Just down the aisle in the O&C Building from the EM-1 spacecraft elements, the EM-2 pressure vessel sits in the birdcage structural outfitting tool. Lockheed Martin technicians will be working to turn the structure into the first Orion Crew Module that will fly crew. Credit: NASA/Rad Sinyak. The spacecraft to fly on EM-2 will be the first Orion fully-configured to support crewed missions, adding the complement of Environmental Control and Life Support Systems (ECLSS) and crew systems such as displays and controls that will support the requirement of flying a four-person crew for twenty-one days. That evolution in the Orion design is currently going through its Delta Critical Design Review (CDR). A look inside the EM-2 pressure vessel on November 14, 2018, as it sat in the O&C Building. Once structural outfitting is complete, the pressure vessel will go through a proof-pressure test and then outfitting inside and outside will begin. Credit: NASA/Rad Sinyak.